(From top left) Wow!!! My little blog has reached over 300 followers. Made some cherry bake well tarts on Wednesday - you can see my recipe here. Scott made us pizzas on Wednesday and they were delicious - pretty good for his first attempt. Started buying some stationary for uni... better suited for a primary school child maybe? Dresses up for an afternoon of shopping and the cinema. Went with Scott to see The Inbetweeners 2 at the cinema. Another busy week in the life of G is for Gingers and Wednesday officially marked 4 weeks until I move into my student flat. Time is passing quicker than ever which is always scary - it feels like I will be graduating before I've worked out what is happening. 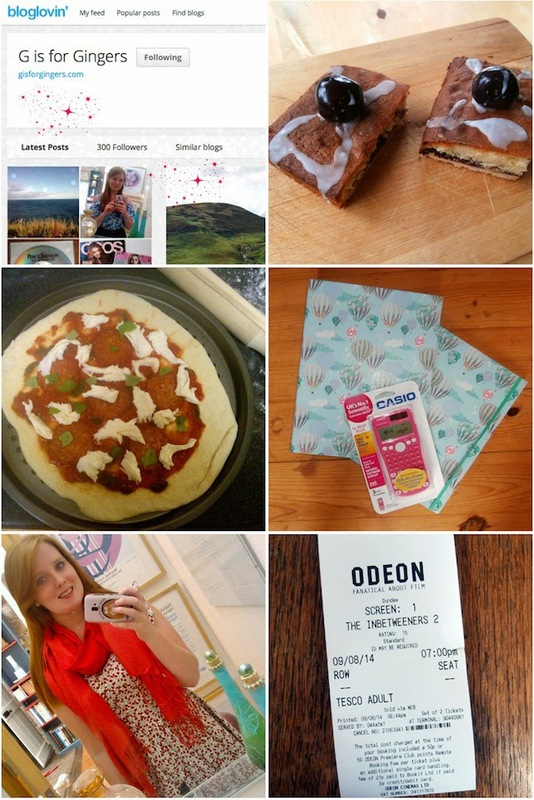 One of the best things to happen this week is my wee blog has some how reached 300 Bloglovin' followers - to think that 300 of you lot think its worth following is just amazing. My blog really feels like it is growing into just what I want to to be. Another pretty awesome thing that happened this week was Scott decided to change things a little for our night in (normally Mexican food) and made dough for us to make our own pizzas. I come from a family who make their own every week and my mums technique is perfect and her pizzas are delicious. This was Scotts first time making the dough from scratch so I was prepared to cut him some slack but he totally didn't need it. The pizzas were super tasty and will defiantly be repeated soon. You can see what they looked like when they came out of the oven here. I am very very pleased my boyfriend can cook! On Friday I went on a little day trip with my family - we popped over to fife for the afternoon. Dad needed some things from the bee keeping shop and mum and I browsed the cute 'shabby chic' style shops. I didn't get anything however on the way home I spotted these super cute (and glittery) note books in sainsburys. I know I'm going to uni but I couldn't resist them. Most weekends Scott and I try to get out and do something together. This Saturday he was keen to go and see 'The Inbetweeners 2' so after swapping his tesco vouchers (he is so savvy) we headed off. We did a little shopping first - sadly topshop didn't have these sandals anything more that I was dying for but primark did have a lovely black fedora. It was fate - after I was just telling my boyfriend how much I wanted one and trying on more expensive ones we walked into Primark and there it was for only £7. It will feature in EVERY outfit post until it wares out. We caught some tea at the DCA's Jute Cafe Bar (a real favourite of mine in Dundee) before heading to the cinema. The film was really good and funny just like you would expect with lots of cringe (hide behind scarf) moments. If you are an inbetweeners fan you won't be disappointed. After rambling on for a while you can keep up to date with what I do throughout the week on my instagram. I hope you've all been having a good summer too. That pizza looks so yummy! What lovely photos! Woooohoo! I love pizza! You're handsome! Love the mirrorlfie!